China rules out open Hong Kong poll Jump to media player China rules out open nominations for the next Hong Kong leadership election, in a move that has dismayed pro-democracy activists. Pro-China rally in Hong Kong Jump to media player A major pro-government rally in Hong Kong has drawn thousands of supporters, in response to civil disobedience campaigns by activists. Hong Kong vote reform report due Jump to media player A report on electoral reform in Hong Kong is due to be presented to the Chinese government. Hong Kong bankers call for reform Jump to media player A group of workers from Hong Kong's financial industries have told China's leaders democratic reforms are needed to protect the city’s status as a top financial hub. 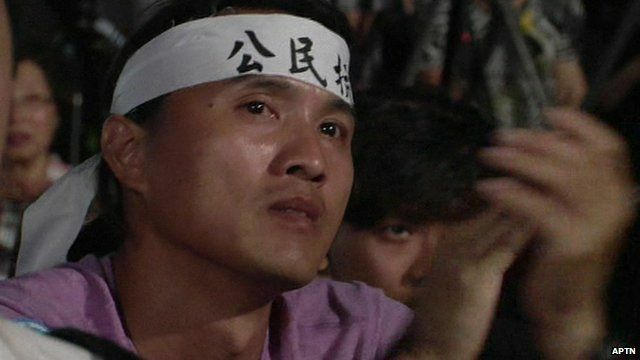 Hong Kong marks Tiananmen anniversary Jump to media player Tens of thousands have gathered in Hong Kong for the only major commemoration in China of the 25th anniversary of the Tiananmen Square massacre in Beijing. Does a game reflect China's politics? Jump to media player China Editor Carrie Gracie has been finding out what an ancient Chinese game can tell us about China's political landscape. China shuts down Beijing Film Festival Jump to media player Chinese authorities shut down the 11th Beijing Independent Film Festival on its opening day. Chinese authorities have ruled out open nominations for elections to choose Hong Kong's leader. Authorities said two to three candidates would be nominated by a "broadly representative" committee and the decision is expected to limit the selection of candidates to pro-Beijing figures. The pro-democracy Occupy Central movement is launching a sit-in in the city's central business district in protest. Damian Grammaticus reports from Beijing.